The summer heat and cool winters allow Arizonians to produce some of the fullest-flavored sweet oranges in the country. Plus, sweet orange varieties still are grafted upon the durable sour orange rootstocks, something no longer done in Florida and Texas because of disease. Southern Arizona cities like Tucson and Phoenix grow sweet orange varieties like Valencia well since their winters are free of frost. 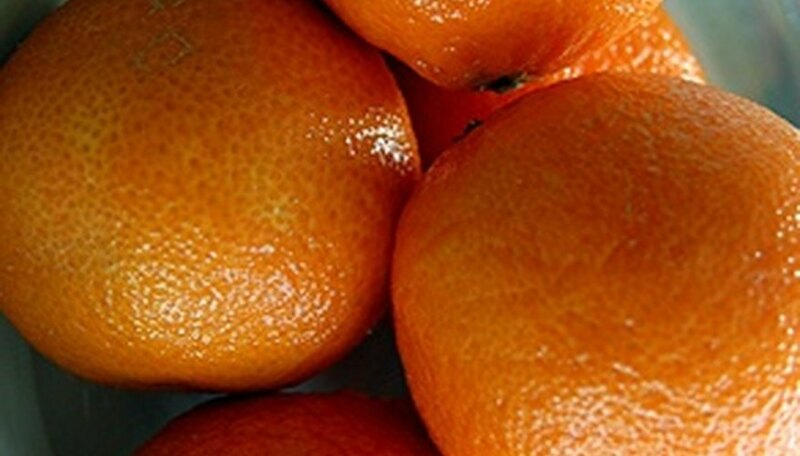 Provide sweet oranges a location where they receive more than 8 hours of direct sunlight daily and year round. In the hottest summer Arizona weather, expect some foliage to scald. Prevent sun from reaching the trunk bark by painting it with white latex paint, wrapping it with a pliable cloth or nylon or allow leafy lower trunk twigs to remain. Young saplings' trunks are especially prone to damage in the summer sun rays. Late September proves to be the best time to plant a sweet orange tree since the summer's heat wanes and the roots can establish for months before next growing season. Ideally, plant the citrus in deep, sandy to loamy soils with 3 to 4 feet in depth, although they grow on shallower soils that are only 12 to 18 inches in depth. Non-alkaline, well-draining soils are best as are orange varieties grafted upon sour orange rootstock. Incorporate organic matter into the soil and use an organic mulch on the soil surface, keep it at least 2 feet away from the trunk. Proper watering is the key to successful sweet orange tree culture in Arizona's low deserts. Use canal or collected rainwater rather than well or municipal water, which contain too many salts. In deeper garden soils, provide 1 to 1 1/2 inches of water every 1 to 2 weeks in the heat of summer so that roots penetrate more deeply into the ground. Whereas in shallow orchard soils that are no more than 16 inches deep, supply 1 inch of more frequently, ensuring the soil dries out in between watering but doesn't become bone-dry. While soils need to be drier in the cooler winter months, every 3 to 5 weeks, ample but not excessive watering in the heat of the spring and summer growing season encourages good flowering followed by fruits with good-flavored flesh with nondiluted juice. Use slow-release granular fertilizer or organic types on your sweet orange trees. Apply granular, man-made citrus fertilizer at half the recommended dosage rates listed on the product label, according to the Phoenix Tropicals website. Fertilize in early March, late May and middle September. Don't fertilize newly planted trees the first year in the ground. Organic fertilizers like fish emulsions or cured compost needs to be applied monthly in spring and summer. People unfamiliar with growing oranges often harvest fruits too early in the winter, perplexed as to why their "sweet" orange varieties provide such sour-tasting fruits. Luckily, ripe oranges persist on the tree for up to four months, saving the need for immediate harvesting and storage. In fact, allowing the chilly winter nights to reach fruits causes the bitter acids to convert into sweet, tarty sugars. If possible, pick fruits in mid-to-late winter or later for sweetest flavors. In addition, do not over water orange trees. The hot, dry Arizona summers are beneficial and are easily managed in the orchard with proper watering to develop good quality fruits. Check soils in the morning for moisture before deciding to irrigate. Expect foliage to temporarily wilt in afternoon summer sun even if soil moisture levels are perfect and adequate. Sweet oranges need little if any pruning in their lifetimes and rarely do pests afflict Arizona citrus trees.